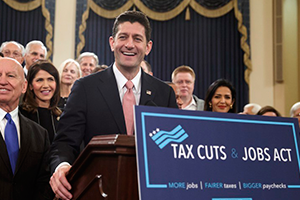 by Newt Gingrich: Speaker Ryan and House Republicans deserve real acclaim for passing the Tax Cuts and Jobs Act this week. After enduring a painful first half of 2017, consumed primarily with the seemingly endless Obamacare repeal and replace debate, Speaker Ryan announced in July that he was ready to focus his efforts on passing tax cuts – a wise decision that provided Republican members with more time to come up with solutions for Obama’s problem-ridden healthcare legislation. However, Speaker Ryan also recognized that after nearly six months of bickering amongst themselves, Republicans were stifling their own progress (much to the delight of the news media and the Left) and that he could unify GOP members in the House, Senate, and White House by focusing the Republican legislative agenda on an area where they were likely to find common ground: tax cuts and job creation. Many in the media, and even some in his own party, criticized Ryan for his decision. However, two months later, he – along with Senate Majority Leader Mitch McConnell and President Trump – announced the Republican tax framework that became the foundation for both the House and Senate versions of the Tax Cuts and Jobs Act. This immediately showed the nation that Republicans were on the same page and were determined to work together to bring much-needed tax relief to hardworking Americans. The Left and the media became unable to ignore the fact that Republicans at every level of government were working and progressing toward making a tax cut overhaul a reality. Now, two months after the tax framework was announced, the House of Representatives has passed legislation that will grow our economy, cut taxes for most Americans, and help make the United States more competitive on the world stage. Ryan and other Republican leaders were able to accomplish this feat in roughly four months – which is incredibly fast for drafting and passing legislation in the House. In 1981, President Reagan submitted his tax cut proposal to Congress in February, and it was signed into law six months later. If the Senate moves quickly, they may meet or beat Reagan’s record. However, there is still much more work that needs to be done. If Republicans are to meet President Trump’s goal of passing tax cuts by Christmas, the GOP senators must work diligently to pass their version of the bill, and then both chambers will need to come together and work out the terms of the final legislation. It is tremendously important that Republicans stay focused on the common ground in both of these bills and not get mired in or distracted by arguments over niche policy. The news media will be desperately trying to magnify every minor disagreement between Republican members over the Tax Cuts and Jobs Act in an effort to deter GOP legislators from enacting real, positive change for the American people. I am certain that across the nation, editors and reporters are already conceptualizing the “GOP at odds over taxes” storyline. No doubt, they have their preferred Democrats on speed dial ready to bolster their stories. Republican members can successfully defeat the elite media’s attempts to overshadow the positive strides that GOP legislators are making toward economic reform, but to do so, they must all remain united, resolute, and focused on their efforts to pass tax cuts by Christmas. This week, Speaker Ryan and House Republicans took a vital step toward that goal, but there is still a long race ahead – one that Republicans must win. Tags: Newt Gingrich, commentary, Speaker Ryan, House GOP, Important Milestone, Taxes To share or post to your site, click on "Post Link". Please mention / link to the ARRA News Service and "Like" Facebook Page - Thanks!